Anyone who has ever spent time around the courts will tell you in any marriage of more than a week old, there are grounds for divorce. The hard bit is to find grounds for marriage. What makes Brexit so remarkable is while so much energy, effort, and thought is invested in the UK's break-up with the EU, so little consideration is given to what remains after a messy parting. 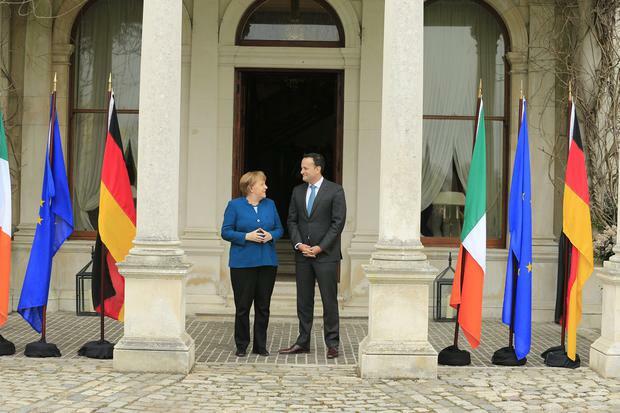 So there was something reassuring in the presence of German Chancellor Angela Merkel in a dank, cold Dublin yesterday. Her visit was a timely reminder stability and common sense still exist, even if crazy is the new normal with Brexit. Ms Merkel has kept a cool head indulging even the worst political tantrums. While promising to work with Britain to find a compromise, the chancellor has quietly stressed some key principles are sacrosanct. If in Westminster they are tearing the gear-box out of the political engine with so many handbrake skids and U-turns; in Europe, there is a firm hand on the wheel. A strong signal needed to be sent: in London a half-baked plan to "take back control" has been a journey into mayhem; in Berlin, Brussels, and Dublin, control can never be an issue. Behind all the patience and matronly solicitude, a steely message also needed airing. Britain can be given more time, providing it is used constructively. The European elections can not be compromised or more time wasted on fantasies. We are facing the hardest of hard choices. As her spokespeople put it: "This is about peace in Ireland," "We often say Europe is a question of war and peace, but [in Ireland] we can see that it is a question of violence or non-violence." This is a stark truth that must not be lost. Tariffs, trade, and copious amounts of codified rules and regulations must be teased out. And yes, the integrity of the frontier of the single market must be protected. But there are also real life-and-death issues that cannot be wished away. Avoiding military infrastructure - with armed sentries, gun turrets, and checkpoints - must also be paramount. By choosing to familiarise herself at first hand with such critical issues, Ms Merkel is showing true solidarity with the country which will be hardest hit by Brexit within the bloc - just as French President Emmanuel Macron did earlier in the week. As her German MEP colleague David McAllister explained on RTÉ: "It is important for the EU to protect citizens' rights, the integrity of the single market but also to keep the Good Friday Agreement alive." That will not be easy. It is to be regretted while we have perfected the technology for killing, there is no such mechanism for protecting hard-won peace. And so we must trust in our strong allies in the EU and close relationships across the Irish Sea, which Brexit has already done so much to test. Editorial The sickening "parades" staged by Saoradh are a mortal insult to our Republic established 70 years ago this week.